Poll addressed issues surrounding the Israeli-Palestinian conflict, including expectations regarding a permanent settlement. A majority of Israelis and Palestinians, 63 percent and 53%, respectively, support a two-state solution, according to a survey released on Tuesday. The survey, conducted by the Harry S. Truman Research Institute for the Advancement of Peace at the Hebrew University of Jerusalem and the Palestinian Center for Policy and Survey Research in Ramallah, with the support of the Konrad Adenauer Stiftung in Ramallah and Jerusalem, addressed issues surrounding the Israeli-Palestinian conflict, including expectations regarding a permanent settlement, threat perceptions and US foreign policy under the Obama administration. 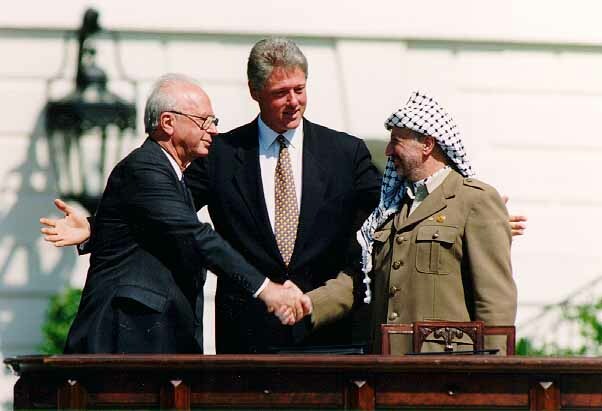 According to the findings, 54% of Israelis and 46% of Palestinians support a permanent- settlement package along the lines of the Clinton parameters [the survey calls them Clinton/Geneva Initiative paramters] proposed on December 23, 2000, which included a divided Jerusalem, a Palestinian state in the entirety of Judea, Samaria and the Gaza Strip except for several large blocs of settlements, and a demilitarized Palestinian state. These findings represent an increase in Palestinian support, up from 43%, and a decrease in Israeli support, down from 56%, for such a deal compared to that reported by a similar poll in December 2012. Furthermore, 47% of the Israelis support, and 48% oppose, the dismantling of most of the settlements in the West Bank as part of a peace agreement with the Palestinians. Only 43% of Palestinians, compared to 58% of Israelis, agreed to mutual recognition as part of a permanent-status agreement after all issues in the conflict are resolved and a Palestinian state is established. The poll also addressed the attitudes and perceptions toward the increased US involvement in the Israeli- Palestinian conflict. According to the findings, 23% of Israelis believe the Obama administration’s policy is more supportive of Israel, 28% believe it is more supportive of the Palestinians, and 40% believe it is equally supportive of both sides. This marked a significant increase in the Israeli belief that US policy is more supportive of Israel or balanced under Obama compared to previous polls; in December 2009, only 13% of Israelis believed US policy was more supportive, 40% thought it more supportive of Palestinians and 37% found it equally supportive. Similarly in August 2009, the relevant percentages were 12%, 40%, and 23%, respectively. Nevertheless only 39% of Israelis respondents said an increased US role in the Israeli- Palestinian conflict would be successful, while 29% said it would be a failure. Compared to a September 2009 poll, there is a slight decline in expectations of US involvement, 42% and 30% respectively. Along the same lines, 41% of Israelis said Israel should yield to American pressure if the US, under the Obama’s leadership, pressures it to accept a two-state solution, and 43% of said Israel should reject such pressure. While 37% of Palestinians support yielding to US pressure to accept the Clinton/Geneva Initiative-permanent settlement proposals, 59% believe Palestinians should reject such pressure. Despite majority support for a two-state solution, there remains a great deal of mistrust, mainly on the Palestinian side. According to the poll, 60% of Palestinians believe Israel’s goals are to extend its borders to cover the entire area between the Jordan River and the Mediterranean Sea and to expel its Arab citizens, while 24% think the goals are to annex the West Bank while denying political rights to the Palestinians. On the Israeli side, 34% think the Palestinians aspire in the long run to conquer Israel and destroy much of the Jewish population in Israel; and 21% think the goal of the Palestinians is just to conquer Israel. The Palestinian survey was conducted between December 13 and 16 and included 1,270 adults interviewed face-to-face in the West Bank, east Jerusalem and the Gaza Strip in 127 randomly selected locations, with a 3 percentage point margin of error. The Israeli sample included 601 adults interviewed by phone in Hebrew, Arabic or Russian between December 12 and 21 and included a 4.5 percentage point margin of error. The poll was planned and supervised by Prof. Ifat Maoz of the Hebrew University of Jerusalem and Prof. Khalil Shikaki, director of the Palestinian Center for Policy and Survey Research.